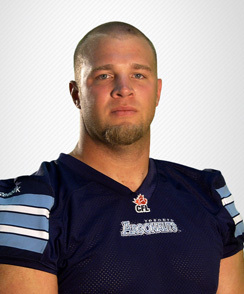 Started in all 18 regular season games in his eight season with the Argonauts…named an East Division All-Star. 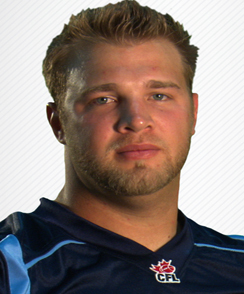 Played in 14 regular season games, starting in 13, in his sixth season with the Argonauts. Playoffs: Started in the Eastern Semi-Final at Hamilton. Started in 17 regular season games in his fifth season for Toronto. 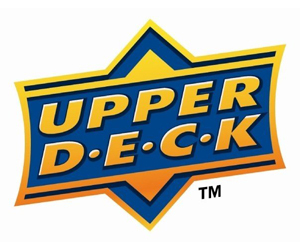 Started 17 regular season games at RT…Week 4 vs Winnipeg, Started at RT… Recorded 1 ST…2012 Playoffs Started at RT in a win against Edmonton in Eastern Semi-Final… Started at RT in a win against Montreal in Eastern Final…2012 Grey Cup Started at RT in a win against Calgary. Dressed in 15 regular season games with fifteen (15) starts for Toronto…Week 17, Added to 9-game injured list with foot injury for loss vs. Edmonton...Replaced at RT by Cedric Gagne-Marcoux. 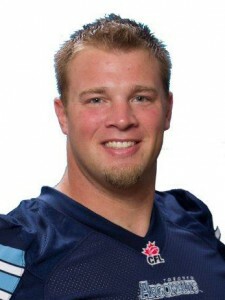 Dressed in and started 14 regular season games at RT for Toronto…Week 3, Added to IR for win vs. Calgary…Replaced at RT by import OL Shannon Boatman…Week 4, Added to IR for win vs. B.C…Week 6, Returned to line-up and started at RT in win at Edmonton… Week 9, Started at RT in Labour Day Classic loss at Hamilton…Made first career catch (06/09/10) on a 10-yard pass from Cleo Lemon early in the third quarter…Was injured on the play and did not return to the game…Week 10, Added to IR for loss at B.C… Replaced by Shannon Boatman… 2010 Playoffs Started at RT in Eastern Semi-Final win at Hamilton…Started at RT in Eastern Final loss at Montreal…Recovered 1 own team fumble. 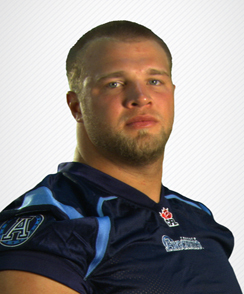 Dressed in 11, starting 3 games, at guard and tackle for the Argonauts... 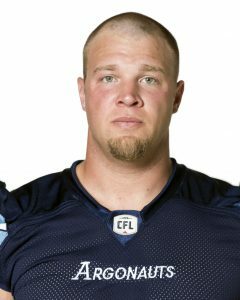 Weeks 1-7, Added to practice roster...Week 8, Dressed at backup OG in first-ever CFL game (28/08/09) in loss vs. Calgary…Week 15, Dressed at backup OG and entered game in first quarter at RT when starter Brian Ramsay suffered a leg injury in loss vs. Edmonton… Week 16, Made first-ever CFL start (23/10/09) at RT, in loss vs. Hamilton… Week 17, Started at RT in loss at Edmonton… Week 18, Started at RT in loss vs. Montreal. 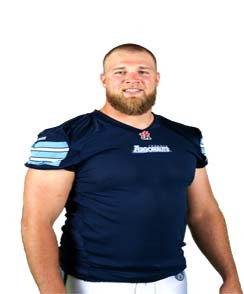 Signed with Toronto as a free agent on September 5…Attended training camp with the Montreal Alouettes…Added to club’s practice roster and remained there until Week 9 and released...Week 11, Signed to Argos’ PR and remained there for the duration of the season. 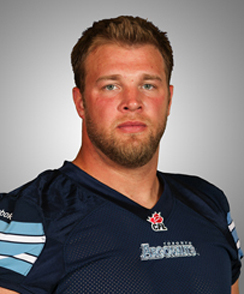 Drafted by Montreal in the third round (18th overall) of the CFL Canadian Draft… Attended training camp with the Alouettes but returned to school in August…Re-joined the team in October and remained on the club’s practice roster for the rest of the season. Chris Van Zeyl (pro: Van-ZILE) majored in geography at McMaster and hopes to be in law enforcement one day. He is the oldest of four: Adrian (brother), Elizabeth and Janine (both sisters). Chris’ mom is Betty and his father is Casey, and the family lives in Font Hill, Ontario where Chris grew up. Chris attended high school at Notre Dame H.S. 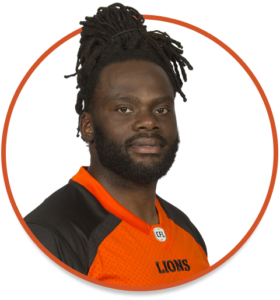 in Welland, Ontario and he spends his off-seasons training, working with the McMaster football coaching staff and coaching a women’s flag football team.